The TeraTune® provides a tunable narrowband terahertz source with a tuning range from 1.5 to 20 THz and a bandwidth of less than 100 GHz. 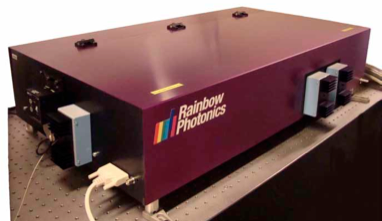 The basic TeraTune® is based on a flash lamp pumped laser (repetition rate 50 Hz to 200 Hz) with a special optical parametric oscillator (OPO) where one wavelength is tuned electronically with a special design to keep the bandwidth below 100 GHz. Other diode pumped laser systems can be offered. The variable wavelength is calibrated and the THz difference frequency is computer controlled (tuning range 1 to 20 THz). 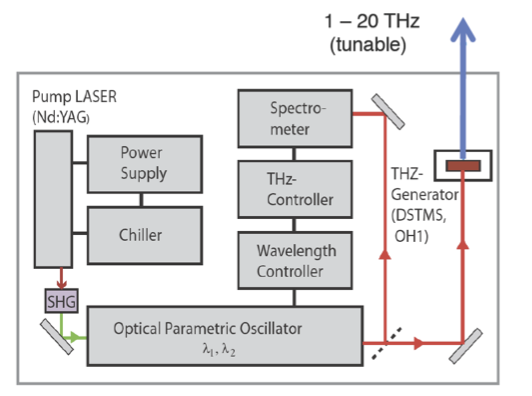 Terahertz radiation is generated via frequency mixing in the novel organic nonlinear optical crystal DSTMS, ideally suited to achieve highest terahertz conversion efficiency. The TeraTune® includes all optical, mechanical, electronic components for the generation of THz waves and software control.